Online Banking refers to banking services where depositors can manage their accounts over the Internet, rather than visiting a branch or using the telephone. 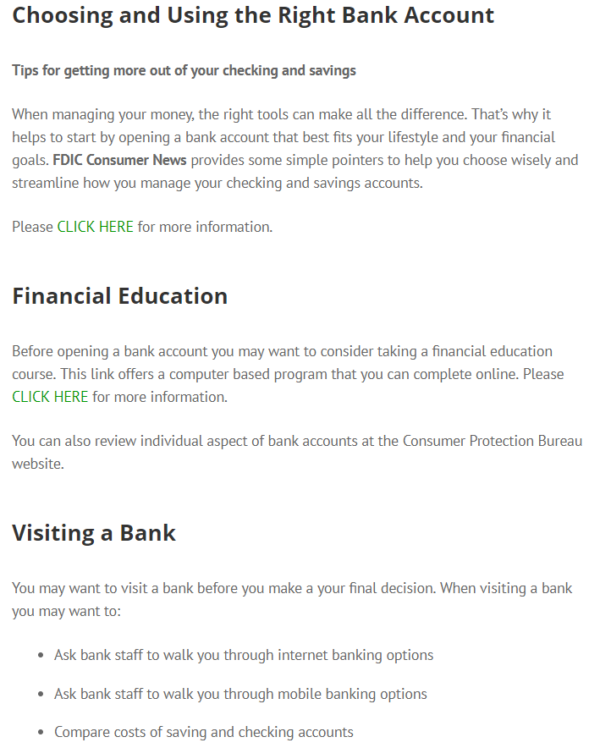 Online banking typically utilizes a secure connection to banking information through a home computer or another device. Many financial institutions offer FREE online banking to their customers. Mobile Banking is a service provided by a financial institution that allows customers to conduct financial transactions with a mobile device such as a mobile phone or tablet through an app. It allows people to manage finances from anywhere, anytime. Mobile Banking benefits are similar to Online Banking. (Most financial institutions require mobile banking customers to have online banking services. Check with your financial institution for details). Why request e-statements/e-bills instead of paper? Password protect your Wi-Fi so it’s more difficult for your web sessions to be hijacked. Create unique passwords with upper case and lower case letters, as well as numbers and symbols. Only use trusted sources or links by going directly to the source instead of referrals through social media or emails. Avoid sharing confidential information (passwords, PIN numbers) through unsolicited emails or phone calls. Keep browsers and software up-to-date to help prevent cyber attacks. Install a security solution on your devices with antivirus software for more protection and privacy. Limit access to your computer to those you trust or set up multi-user accounts with separate passwords. Don’t use public Wi-Fi hotspots when conducting financially sensitive transactions and be wary of ‘shoulder surfers’ viewing your screen from behind. Log out when you finish financial transactions to reduce chances of the session being hijacked. Set up notifications (text or email) to alert you to suspicious activity on your account. Personal finance apps can help Android and iPhone users manage their money. There are apps to help you save, invest, budget and more. New apps become available frequently — check out the 25 apps in the Top Personal Finance Apps 2018 list from a Money Smart KC Partner. Download apps from your favorite stores to get coupons and other special deals. Always check out features, costs and reviews of other users so you can make an informed decision before downloading an app.